Congenital limb deficiencies are reported in every 6/10,000 live births per year in the USA. As per the centers for disease control and prevention estimate, 2250 babies are born every year in the USA with a congenital limb deficiency of the upper or lower limb. The upper limb gets involved two times more as compared to the lower limb. Recent data suggest a relationship between paternal occupation and increased prevalence of birth defects, including limb deficiencies, in offspring of artists. The known causes for congenital disorders include medications such as thalidomide, retinoic acid, and misoprostol, vascular disruption (e.g., amniotic band syndrome), vascular malformations (e.g., Poland syndrome), or genetic factors (spontaneous point mutation). Animal experimental studies suggest that limb deficiency in amniotic band syndrome may be due to hypoxia followed by cell damage, hemorrhage, tissue loss, and reperfusion. In most cases, the cause may not be known. Transhumerus amputation (acquired amputations) in contrast occurs following trauma or disease (i.e., neoplasm or infection.) It is difficult to detect these deficiencies before birth In spite of prenatal screening ultrasound scans. In a child with a congenital transhumeral deficiency, an active elbow joint does not exist; hence, the child lacks the ability to grasp objects in the cubital fold. As the deficiency becomes increasingly proximal, as with shoulder disarticulations, it becomes increasingly difficult to perform functional activities. If the child has bilateral upper limb deficiencies at the more proximal levels, the child can work with occupational therapists to perform activities of daily living with their feet. Most of the attention in these children is paid to the social management, but they may have local problems too at the amputation site including pain, neuropathy, bony spike, and bone overgrowth, trophic changes in the skin, muscle wasting, and ill-fitting prosthesis. 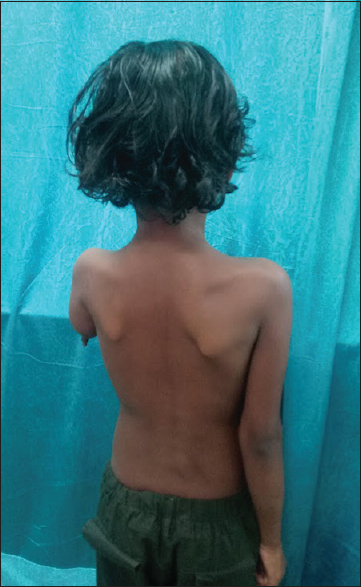 We are reporting a case of a 7-year-old girl who presented to us at the age of 7 years with local bony overgrowth but did not want any surgery. A 7-year-old female child presented to us with left-sided transhumeral congenital amputation. There was no history of trauma or any other associated congenital anomalies. The child was not using any orthotics, could do all her work by the right upper limb and was not trained to use the lower limbs instead of upper limbs. There was no history of similar problem in other members of the family. The mother did not give history of using any medication, radiation, viral infection, or trauma during pregnancy. The girl had a mobile atrophic upper limb with a long stump covered by thin skin devoid of any muscle and the tip had the bone of chitinous material like a horn or nail [Figure 1] and [Figure 2]. An X-ray taken of the amputated limb showed terminal bony overgrowth for several centimeters ending in a long spike devoid of any soft tissue cover [Figure 3]. 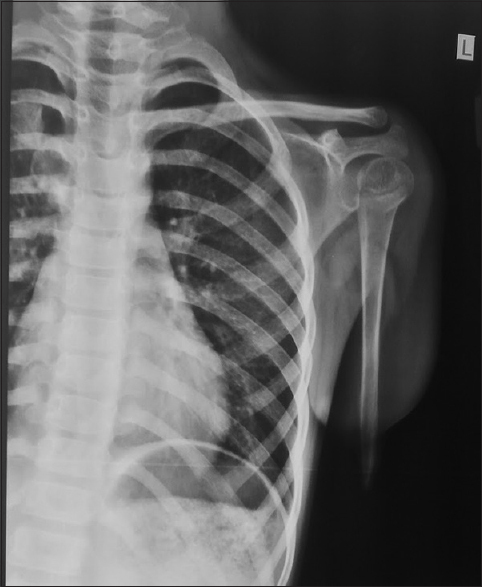 The bony overgrowth was difficult to distinguish from parent bone and was also suggestive to be as a result of bony growth due to the growing proximal epiphysis of the humerus at shoulder joint. The patient's parents were advised a revision of congenitally amputated humerus stump with a bone graft at the tip to avoid further growth, but they denied any surgical procedure and were then only counseled for occupational therapy. Terminal bony overgrowth can occur in children with acquired amputations through a bone and in congenital limb deficiencies. The terminal overgrowth results from the development of appositional new bone on the end of the residual limb. Terminal overgrowth of bone causes pain, bursitis, and if left untreated, can penetrate the skin. Postamputation other complications include: Pain from overuse syndromes from compensatory techniques, low back pain from altered gait, neuroma, Joint contractures, heterotopic ossification, dermatologic and skin concerns, including wound dehiscence, skin breakdown/ulcers, verruca's hyperplasia, dermatitis, folliculitis, and hyperhidrosis, Psychologically grieving limb loss, depression, body-image concerns, posttraumatic stress disorder, and poor fit with prosthesis. A multidisciplinary/interdisciplinary approach is recommended when available, with biannually coordinated assessments by the physician, physical therapist, occupational therapist, prosthetics, social worker, psychologist, and nurse to do holistic management of children with congenital disorders. In addition to managing the medical complications, the physiatrist can assist with the patient's life care plan to include potential changes in function/functional goals, medical concerns that may be encountered as the patient ages, planning for a prosthesis, adaptive equipment, therapies, psychological needs, and peer support. The physical therapist can assist with contracture prevention; core strengthening, balance, gait, endurance, and work on a home exercise program. The occupational therapist can evaluate activities of daily living and assist with adaptive-fitting, and in the case of concomitant upper limb involvement, the patient may need to learn how to use his or her feet for activities and will need to remove the prosthesis for foot use. The prosthetics inspects the integrity of the prosthesis and makes adjustments for growth as necessary to ensure adequate fit in collaboration with the physician. A social worker and psychologist are often needed to assess the patient and family for psychosocial risk factors, depression, problems with self-image/self-esteem, acceptance of disability, and bullying or other school issues. Multidisciplinary management best ensures holistic care of a developing, growing child with a limb difference or acquired amputation. In the community-based practice in which a multidisciplinary approach is unavailable, physician follow-up should be coordinated with the prosthetics whenever possible. Fitting prosthesis should be considered along with the age and developmental milestones of the child with a congenital limb difference. 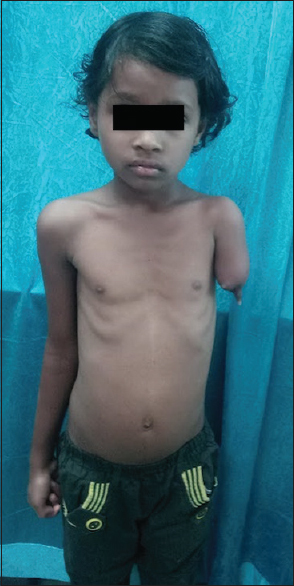 A 7-year female child with a congenital transverse, terminal amputation of the left arm needs a holistic care. Bony outgrowth needs surgical rehabilitation followed by proper orthotic training which lacks in multiple setups in India. Poverty is a major setback which prevents these patients getting ideal aids, and holistic treatment and efforts should be done to provide basic physical medicine and rehabilitation (PMR) set-ups at all levels so that proper counseling may be done for better management. Centers for Disease Control and Prevention. Available from: http://www.cdc.gov/ncbddd/birthdefects/ul-limbreductiondefects.html#ref. [Last accessed on 2014 May 22]. Desrosiers TA, Herring AH, Shapira SK, Hooiveld M, Luben TJ, Herdt-Losavio ML, et al. Paternal occupation and birth defects: Findings from the National Birth Defects Prevention Study. Occup Environ Med 2012;69:534-42. Werler MM, Pober BR, Nelson K, Holmes LB. Reporting accuracy among mothers of malformed and nonmalformed infants. Am J Epidemiol 1989;129:415-21. McGuirk CK, Westgate MN, Holmes LB. Limb deficiencies in newborn infants. Pediatrics 2001;108:E64. Yoon PW, Rasmussen SA, Lynberg MC, Moore CA, Anderka M, Carmichael SL, et al. The national birth defects prevention study. Public Health Rep 2001;116 Suppl 1:32-40. Hostetler SG, Schwartz L, Shields BJ, Xiang H, Smith GA. Characteristics of pediatric traumatic amputations treated in hospital emergency departments: United States, 1990-2002. Pediatrics 2005;116:e667-74. Alexander MA, Matthews DJ. Pediatric Rehabilitation: Principles and Practice. 4th ed. Demos Medical Publishing: New York; 2010. p. 335-60. Smith DG, Michael JW, Bowker JH. Atlas of Amputations and Limb Deficiencies: Surgical, Prosthetic, and Rehabilitation Principles. 3rd ed. Rosemont (IL): American Academy of Orthopedic Surgeons; 2004. p. 773-914. Yoo S. Complications following an amputation. Phys Med Rehabil Clin N Am 2014;25:169-78. Le JT, Scott-Wyard PR. Pediatric limb differences and amputations. Phys Med Rehabil Clin N Am 2015;26:95-108. Meier RH 3rd, Choppa AJ, Johnson CB. The person with amputation and their life care plan. Phys Med Rehabil Clin N Am 2013;24:467-89.